In a publishing exchange agreement, the UAE’s Kalimat Group begins a French-and-Arabic partnership with France’s éditions Gallimard. 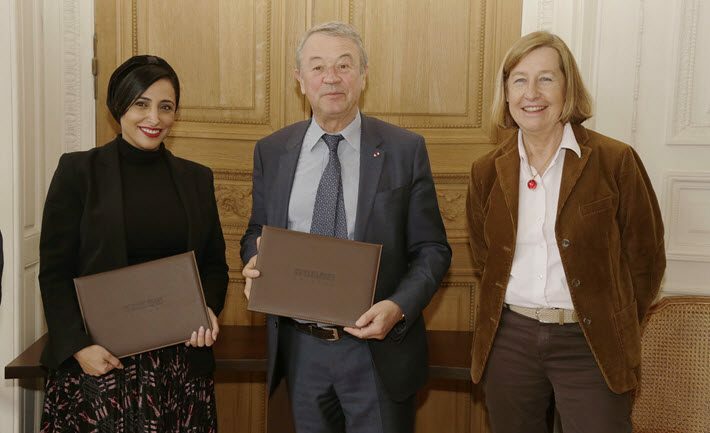 The Sharjah-based Kalimat Group led by the publisher Sheikha Bodour bint Sultan Al Qasimi has today (March 23) signed a memorandum of understanding with France’s Gallimard on the eve of the Salon du Livre in Paris (March 24-27). The new arrangement provides for an equivalent number of titles from each company’s list to be published each year into Arabic by Kalimat and into French by Gallimard. As in other arrangements Kalimat has made with international publishing houses, the initial commitment calls for 10 books to form the exchange. The titles involved include children’s books, YA novels, and comics. Bodour, chief of the United Arab Emirates’ Publishing Association and a member of the International Publishers Association‘s executive committee, has made a key interest of her publishing career the promotion of Arabic literature to the international readership. In comments at the Paris signing, she spoke of this latest partnership as a way to “build communication bridges” between French and Arabic speakers, and she characterized Kalimat’s work as an effort in promoting just such international dialogue. Speaking for Gallimard, Hedwige Pasquet, who is president of the youth division of Gallimard, said, “The éditions Gallimard Jeunesse are carried by people sharing the same demanding ideal—authors, illustrators, translators, designers, and editors—and the same ambition to put the best of imaginary, artistic creation and knowledge into the service of children and teenagers. Pasquet was joined at the signing by Antoine Gallimard, president of éditions Gallimard and of Groupe Madrigall, the latter listed by Publishers Weekly as the 35th largest publisher in the world in 2016. In further comments, Bodour said, “Gallimard has an impeccable history of innovation and has a mutual desire to promote its own literature and increase its business concerns across the Arab speaking world, which has a voracious appetite for knowledge and new experiences. The Gallimard agreement echoes Kalimat’s previous collaboration with Marcus Leaver’s Quarto Group—which translates and distributes jointly produced titles in the Middle East and North Africa—and the Kalimat partnership with Bloomsbury, which again involves an exchange and translation of titles. Members of the news media witnessed Nigel Newton, founding chairman of Bloomsbury, quite proudly showing around a small children’s book last week during London Book Fair. 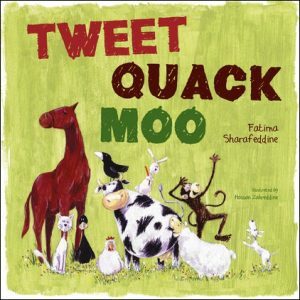 Titled Tweet, Quack Moo, this is author Fatima Sharafeddine’s book with Hassan Zahreddine’s illustrations, teaching children to count to 10 and to imitate animal sounds. “From barking dogs to clucking chickens,” reads the promotional copy, “so many noises to count!” And so there are. Tweet, Quack Moo is the first product from the Bloomsbury side of that publisher’s partnership with Kalimat. Gallimard Jeunesse has published children’s books for 45 years and produces as many as 350 titles per year, many of them noted for their diversity and with a stated goal of looking for innovation wherever possible. The main company, Gallimard, was founded in 1911 by Antoine Gallimard’s grandfather, Gaston. Kalimat Group is a much younger company, established by Bodour in 2007 and comprising a number of leading imprints in Arabic literature. It’s colophon Kalimat marks the first UAE publishing house dedicated to books for children up to age 16. Another imprint, Horouf, was launched in 2013 to produce print and digital educational content.